Well it happened, and I’m a married man! The wedding, reception, and honeymoon couldn’t have rocked any harder or gone any smoother – they simply were an absolute blast. What I remember of them, anyway. Not that I spent the days drinking heavily, but moderate drinking spread over two and a half weeks can really leave your filing cabinet disorganized, if you know what I mean. You can’t tell from the picture, but I had sweat out the 4 morning beers I had prior to the ceremony like a gazelle on the Sahara, and probably smelled about half as good. At this point I had lost my wife completely. In fact, I had also lost myself, since I have no recollection of this picture being taken. Now I’ve never been one of those people to say, “it takes me a week off work just to start relaxing!” – in fact, I consider myself a professional at the activity of leisure. First things first, having a honeymoon directly after the wedding? I couldn’t imagine it doing it any other way. We have friends who had to wait and who chose to wait between a few weeks to a few months, both due to scheduling conflicts, and I simply couldn’t imagine having zero time to unwind after the chaos of that week. We left for Thailand about 12 hours after waking up in the hotel room the day after the wedding, and it was glorious. Know what wasn’t glorious? 15 hours in a plane in Economy class. Come on! Pretty sure cattle cars have more leg room, and with a backpack filled with entertainment (Switch and Playstation Vita! ), there was absolutely zero room to even adjust myself. It was pretty bad. I regretted not opting to cram myself into a shipping crate and sent overseas, and did my best to sleep. Naturally I was placed in the middle of a 3-seater, so let’s just say that it took a lot of excitement for the honeymoon to get us through that experience. We took some drugs and fell asleep for probably 8 straight hours, which made the whole thing much more bearable. 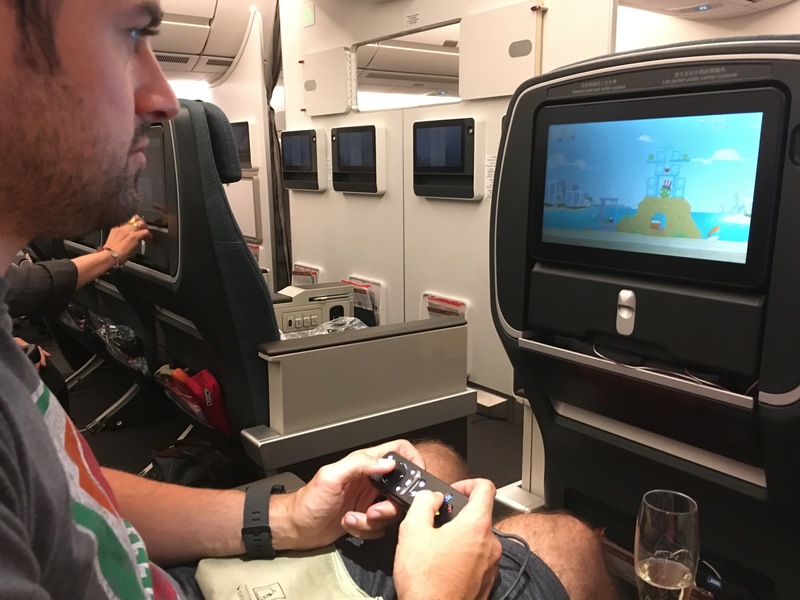 I am ashamed to report, however, that I managed to spend exactly zero minutes playing video games, despite 15 hours in the air! We were just that exhausted and uncomfortable. Riding across the river via ferry in Bangkok! Thailand in itself is an amazing country, I have to say. 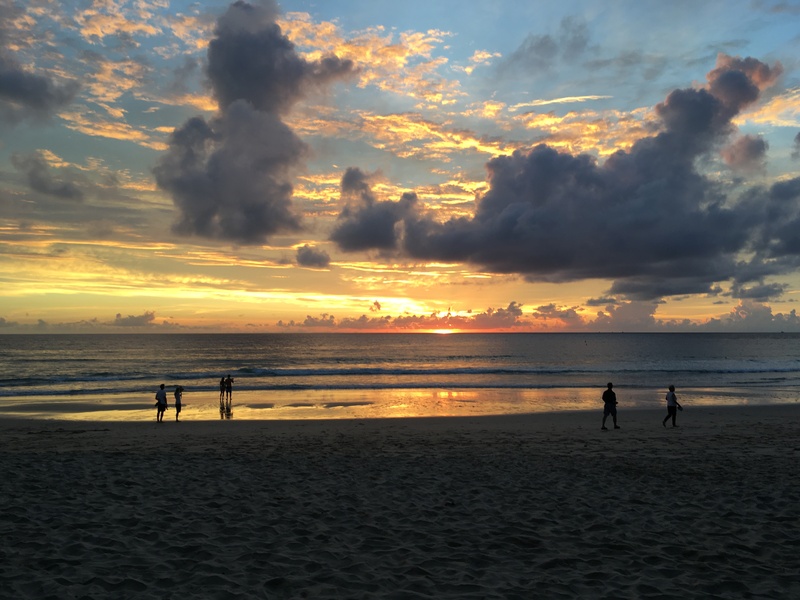 I feel like we had the luxury of having four separate mini-vacations, as we ventured from Bangkok, to Chiang Mai, to Phuket, and finally to Phi Phi Island. All of the places were completely different, from the overall vibe and atmosphere all the way down to the people. I’ll say that on the whole, the Thai people are an incredible group of sweet and passionate people. They all seemed to share one common trait: they were excited to have you there. And I don’t mean from a “trying to get you to buy stuff” perspective – the only time we experienced this kind of thing was in Phuket which I mention in a few paragraphs. They are overall just really friendly people. Thailand isn’t called “The Land of Smiles” for nothing! I can only recommend Bangkok for the experience of seeing Bangkok, for reasons that you just need to see to understand. 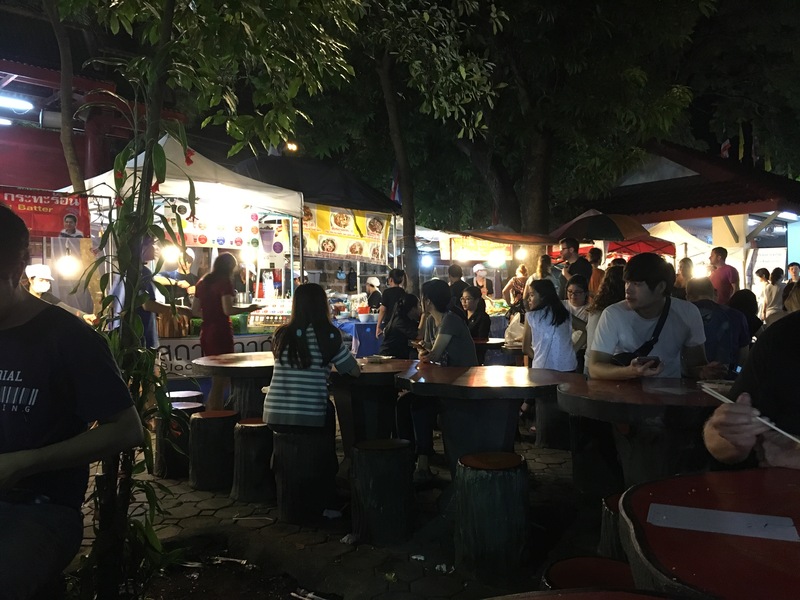 Chiang Mai was, without a doubt, the wife’s and my favorite, the perfect blend between city and suburban vibes, quality street food, cleanliness, English-speakers, low traffic, and low pollution. Reverse all of those things and you have the experience of Bangkok! Which one will appeal to you the most comes from what you are seeking out from your trip. If you speak Thai, or are traveling with someone who does, I can only imagine that Bangkok is infinitely better, because almost nobody speaks a single word of English. 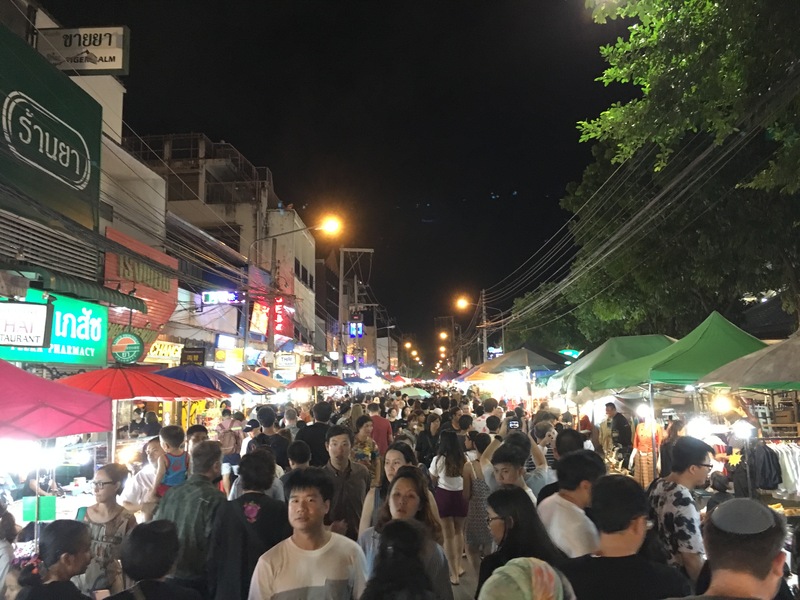 Night market in Chiang Mai. When you need a break from street food. 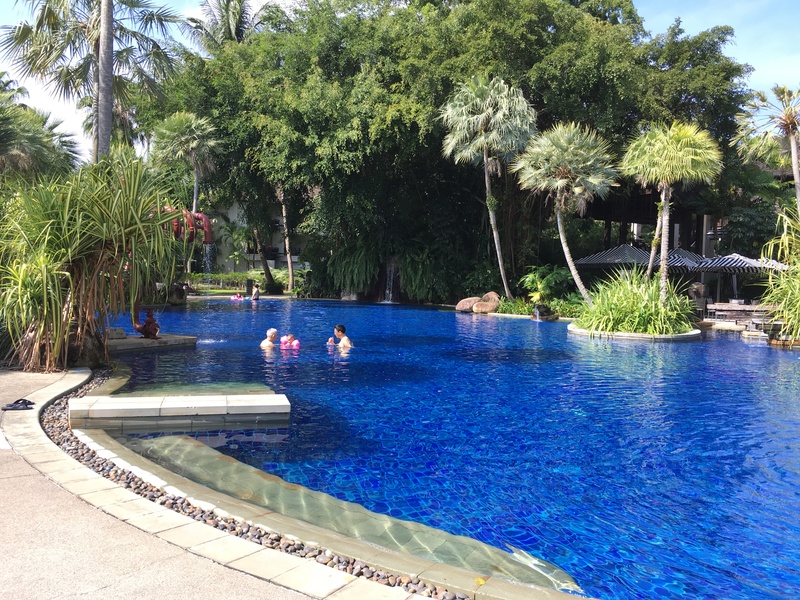 Pool at the Chiang Mai Riverside – beautiful resort! Now without wanting to sound like that pompous American who insists that everyone speak English… I attempted to learn some basic Thai phrases before going over here, not to make my life easier necessarily, but to be respectful of the fact that I’m in their country. What I learned is that Thai is an absolutely insane language to try to learn, as even the pronunciation of basic phrases like Thank You contain some of the most un-English sounds I’ve ever heard. Really, by the end of the two-week trip we were barely comfortable saying Good Morning and Thank You due to the simple issue of replicating the words we were hearing. Go look up some basic phrases and you’ll see what I mean! This paired with the complete lack of understanding any language other than Thai and communication can quickly become an exercise in frustration. However, this was really only an issue in Bangkok. There’s also the issue that “not very spicy” to a Thai person has a very different meaning than to a Cuban girl. 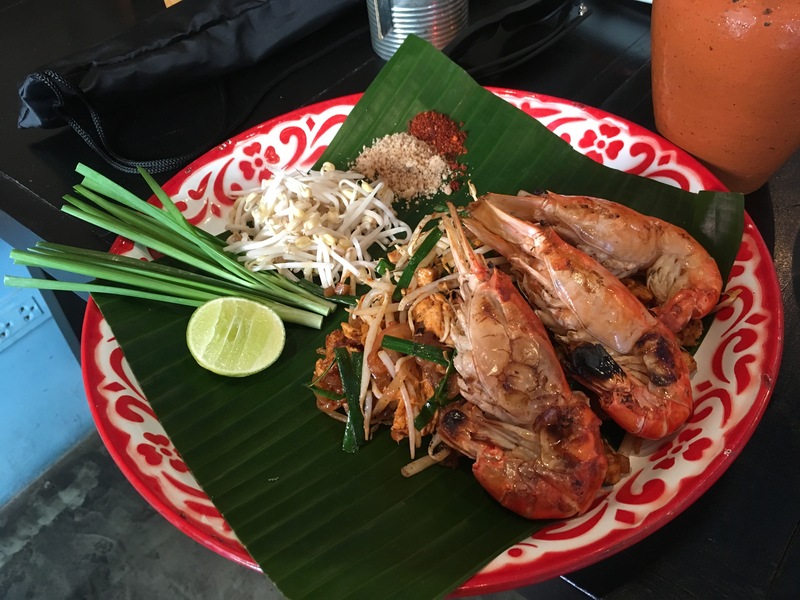 I have never seen a human being sweat as much as when my wife tried her first Thai street food – it smelled delicious and as we were assured that it wasn’t “too spicy,” she practically went up in flames. Bangkok and Chiang Mai are commonly explored as a pair, at least according to the other tourists we met throughout our trip, and I think it works well on the “experience” front, because Chiang Mai seems to have all the good things about Bangkok with none of the bad. Flying out of Chiang Mai was the pivotal moment for the trip. While there was tons of travel within the two-week span, we had organized the whole trip so that the more “eventful” walking around exploring activities were first, with the more relaxing-in-nature things comprising the second half. This idea sort-of worked, although as the wife and I are very active people, every day invariably turns into a race to do as many things as possible before we were forced to depart for the next destination. Although looking back at the sheer number of things we got to experience, absolutely no regrets there! Phuket was the third out of four total stops, and is/was an entirely different trip altogether. We loved Phuket, and the first thing I want to note is that it has, hands down, the finest beaches I’ve ever seen in my life. Breathtakingly clear water and white sand, and not a single stone or shell to step on. 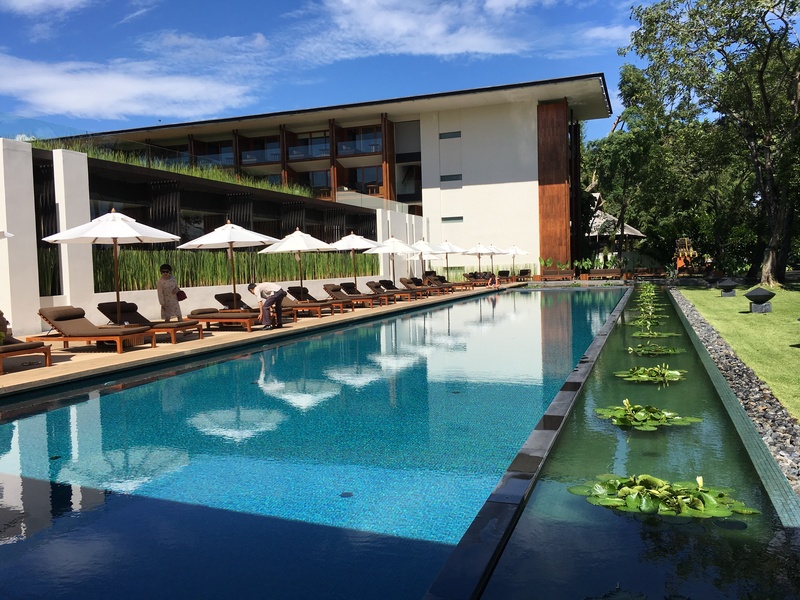 We stayed at a beautiful resort called The Surin that I will spend a lot of time raving about on TripAdvisor in the following days, because this place was perfect. Just go ahead and check out the beach bungalo we got to stay in! The photos are 1-to-1 true to life, which is a pretty rare thing for hotels. The private beach was incredible and the whole resort is perfection. 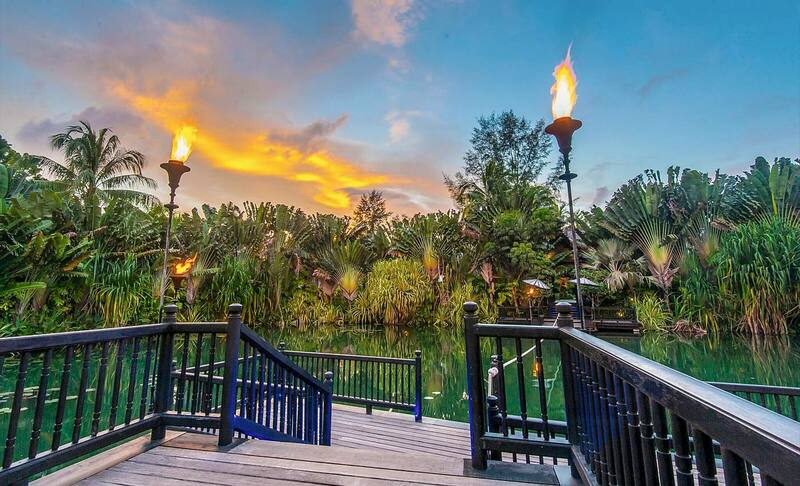 If you’re looking to check out Phuket, look no further than this resort. What wasn’t so hot about Phuket was Patong Beach, hailed as the party zone of the whole island. If you’ve never been to Thailand and are picturing the street-walker-packed roads with drunk tourists, copy-and-paste bars with scantily clad ladies sitting out front, people shoving “Ping Pong Show” laminated sheets into your face, and endless massage parlors with at least a dozen bored looking women sitting outside… yeah, that’s not our scene either. But you’ll find that at Patong Beach. Aside from the awesome street food we found in a random alley with some chill live music, that was definitely not what we were looking for. But an experience is what we sought out! 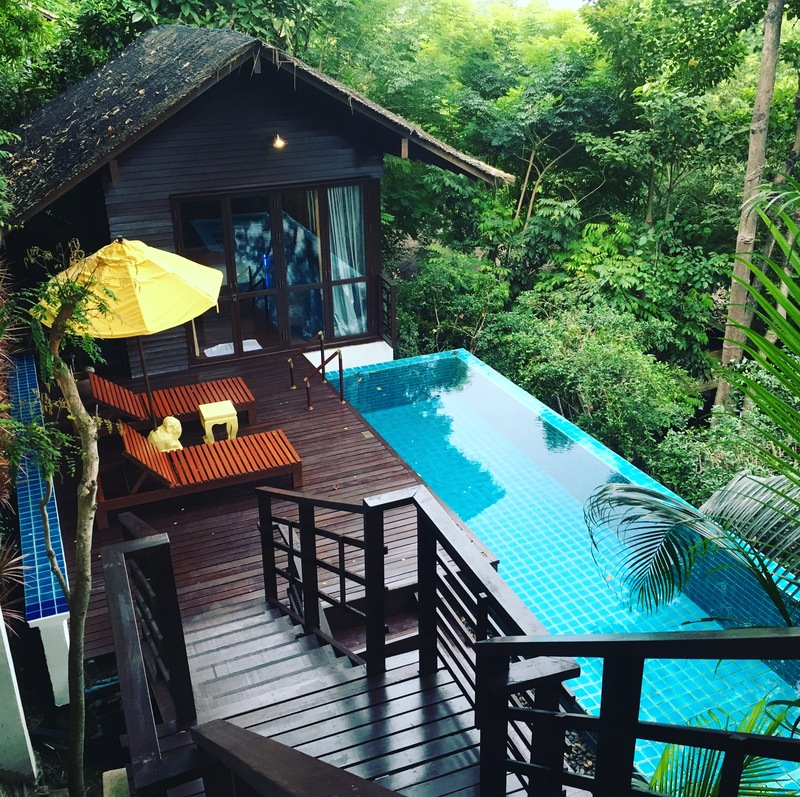 Overall Phuket was great for the sake of the resort and the exploration. We had a great time there and highly recommend The Surin if you’re looking for a relaxing time at the pool and beach, as well as cocktail hours with dirt-cheap ($2-3 each) mixed cocktails. Seriously, you can spend $60 and drink all day if that’s your thing. The last place we stayed was at the elusive Phi Phi Island. Now this place… this place was an experience. I’ve thrown around that word a lot, and so far it’s all been positive, as the word itself can be rather vague in the context. 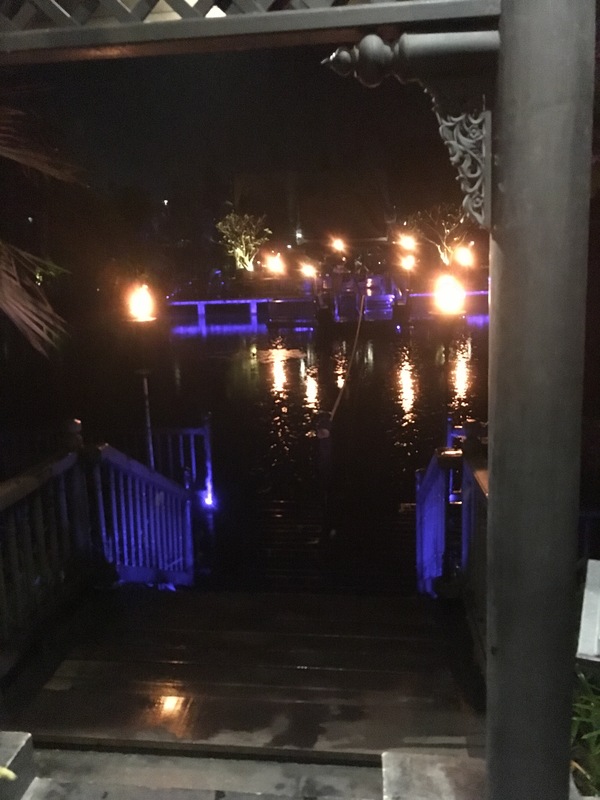 The resort we stayed at is the only TripAdvisor 5-star rated resort on the whole island, and while it definitely has its merits, it literally and figuratively ate us alive. You have to understand that Phi Phi Island very much looks like and is a jungle, and the resorts there are simply in the jungle. There aren’t any roads on the whole island, so expensive and highly pollutant long boats are the primary source of travel along different parts of the island. It’s also far out to sea, and an hourlong speedboat ride isn’t as fun as it seems. If you get motion sick while on boats, you should never, ever go to Phi Phi Island. The place itself is pretty incredible in its own right – we stayed at the fanciest villa it has to offer (it’s our honeymoon after all!). Private pool, living room, you name it. It blew our minds when we first entered, despite the lizard that went scurrying across the floor and under the bed when the hostess first entered. Wildlife is a part of the experience – whether or not that is your thing will highly affect your opinion of this resort. Let me ask you a question: how do you feel about giant frogs? How about millipedes? Do you like being barefoot 24/7? Do you like having to take your shoes off to enter any building? Do you prefer sand footpaths as opposed to paved ones? How about dimly (if at all) lit sand footpaths with frogs and millipedes to avoid stepping on? If you answered “ohfuckno” to any of those questions, you should probably reconsider staying here. Now the place itself looks like the pictures, yes, but this is the type of place where the devil is in the details. The Zeavola could definitely use some minor upkeep as far as the resort goes and more things to do around the resort. We had a very nice spa treatment but everything else was a little underwhelming. It was definitely the most interesting place we stayed, but by the time we left, we had a bit of a “yeah, I’m good” opinion towards that point. We had been sad to leave every other hotel prior, but escaping Phi Phi Island was a welcome change. 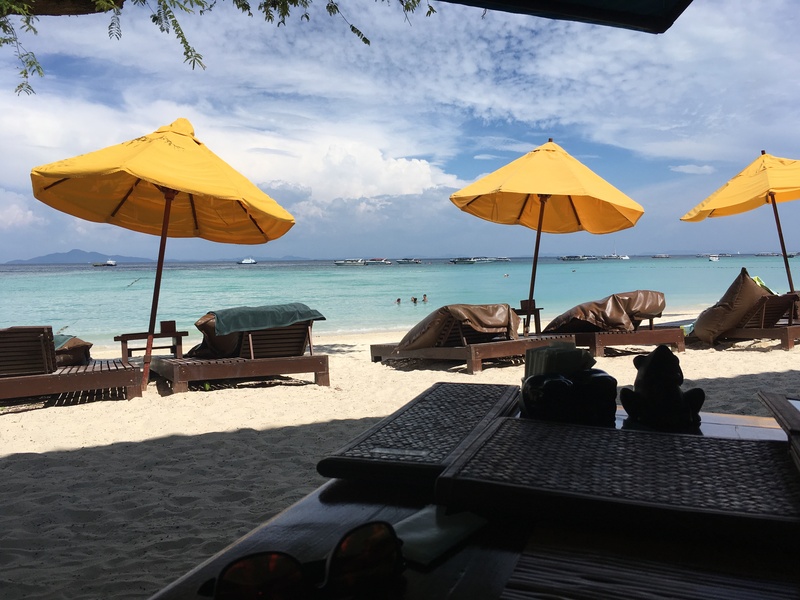 Before heading back to Hong Kong and then transferring flights, as Phi Phi Island is only reachable by unreliable speedboat, we took the dreaded vessel back to the mainland stayed at an incredible resort for one night, right down the street from the airport. 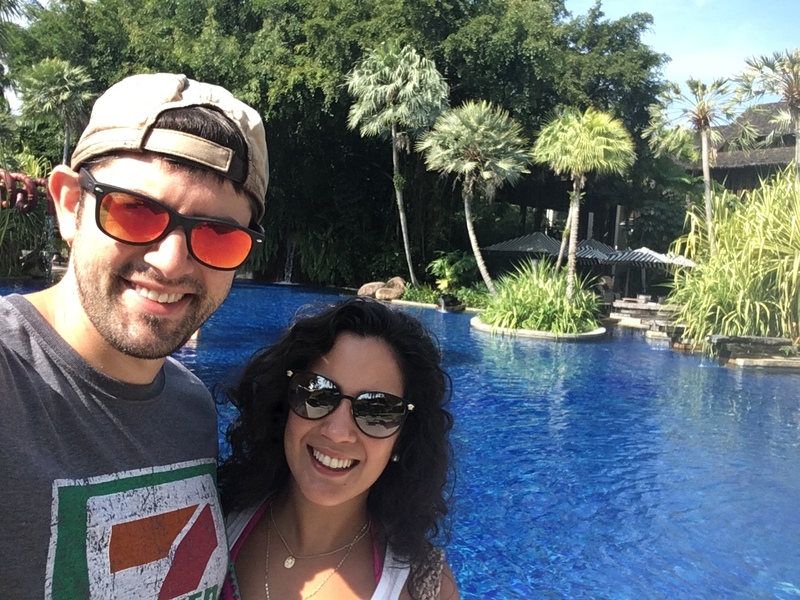 Let me tell you – if you decide to do Phuket, definitely consider this place called The Slate. Built on an old tin mine and keeping true to form with an industrial theme, this place is gorgeous and the rooms were among our favorites from the whole trip. We didn’t do much here except swim in the adult-only pool, drink at the pool bar, explore the beach, and oh yeah: we ate at a restaurant that you can only enter by being pulled across a freaken moat. Nope, no exaggerations here, folks. This was by far the highlight of the trip as far as dinners go, and we partook in some fairly elaborate ones during each of our stops. The CHASE card practically caught fire by the end of the trip, as we also caved to a seat upgrade for the 15 hour flight back to Premium Economy to the tune of $1,100 per ticket. Let me tell you – I’ve spent some cash and bought some fun toys over the years, most of them of the two-wheeled type, but I think that $2,200 was the best investment in my future, or more specifically, an investment in the avoidance of 15 hours of agony. Not only that, but the feeling of waltzing on to the plane before anyone else is a feeling that everyone needs to experience at least once. Personally, I’ll never fly economy again on anything over 7 hours. It’s really worth the double price on the flight back mostly, when you don’t have the excitement of the destination to keep you going. I mean, the upgraded TVs came with so many sweet games and an actual game controller. I even managed to beat the entire Angry Birds game. Unfortunately I managed to do this before the plane even took off so it didn’t exactly chip away at much sky time! Speaking of games, I finally was able to spend some much-needed time with my beautiful Vita playing the likes of Ys VIII: Lacrimosa of Dana as well as a new one I picked up recently, Tokyo Xanadu. More on those to come! I have been up since 5am today as my internal clock is completely devastated, so I do apologize if this post is all over the place. I’ve got many, many more thoughts to write down on all topics, since the past two weeks have been big in terms of gaming news and releases. The wedding ceremony, reception, and honeymoon all went off without a hitch, and I’m so thankful to my incredible wife for all the nonsense that she put up with for the past two years. I remember many times when I thought the things she was spending her time on seemed so insignificant – “why would anyone notice those things?” I would say. And yet, the whole night of the wedding, I had people coming up to me telling me how amazing those little touches were. Seeing the whole thing come together, well… let’s just say it was the best damn time I never want to have again, and it’s all thanks in part to the extreme-detail-oriented nature of my amazing wife. If being addicted to details was an olympic sport, she would be Grand Champion of the World. Previous Post Previous post:That’s All (For Now), Folks! Congratulations and can I say you two look very good together, loved the wedding picture. 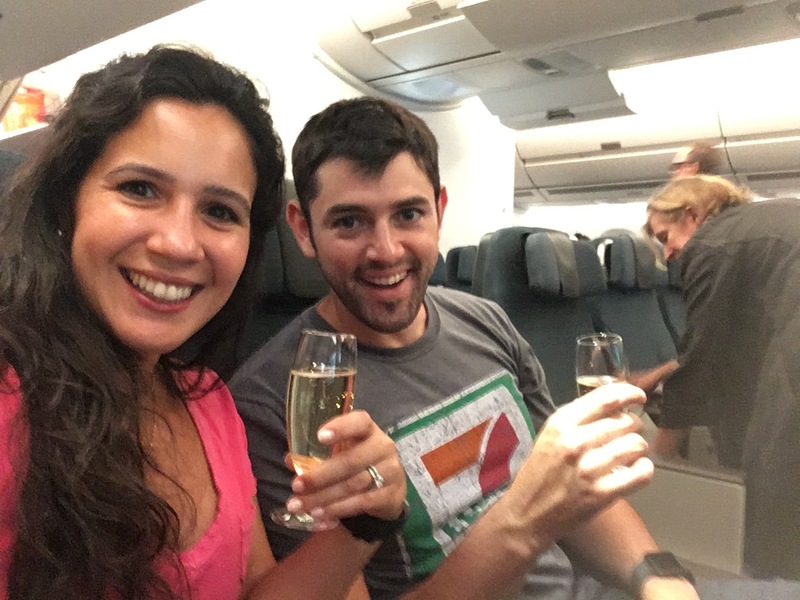 Fun to read about the Thai trip too, and what a great way to start married life! Wow!! That’s an awesome trip you two had. I say it was definitely worth the price to fly back in style too, haha. Haha, thank you Ellen! Yes, I highly HIGHLY recommended doing that if/when you’re on the return flight of a very far away destination. Worth every penny! Congratulations! Looks like you had a great time! Sounds like you had a blast! Well congratulations again and welcome back! All the best in your new life stage together! Your photos were beautiful, and I’m glad you had a wonderful end to a wonderful trip. Congratulations to you both! Wishing you a long and happy life together. Maximum congratulations to you guys! Congratulations! I got married back in March. I wish you both nothing but happiness :). Congratulations! I’m having my wedding this Saturday and I’m going to the Bahamas for a week. Just can’t wait for the day to be here so that I can finally have some peace haha! I bet! I’m either going to be wired the day of, or I’ll just be a zombie. Guess the next few days will tell.